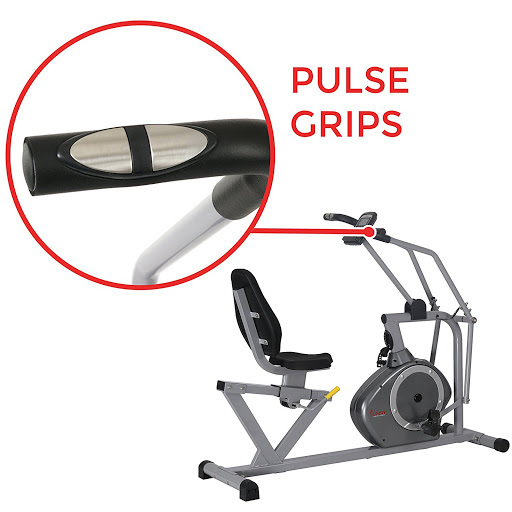 Recently, Recumbent bikes have stood out from the wide-range of indoor exercise bikes. This kind of exercise bike has many advantages, such as the ease on joints, knees, and back, the type of exercises is specialized for blood flow, cardiovascular and lower body workout, and the exercises are easy and interesting enough to motivate you to commit to exercise daily. However, recumbent bikes have some disadvantages since you cannot exercise your upper body using a recumbent bike. If this is the problem for you, you should have a look at Sunny SF-RB4708. 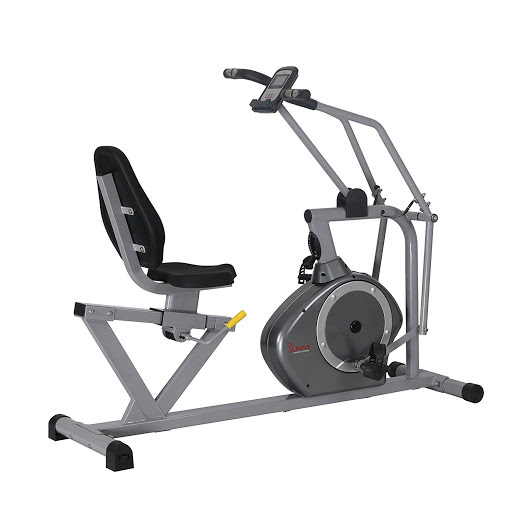 Despite being a recumbent bike, Sunny SF-RB4708 is specially designed to let you exercise upper body. I am going to review Sunny SF-RB4708 in this article. Sunny SF-RB4708 can be categorized as a recumbent bike. 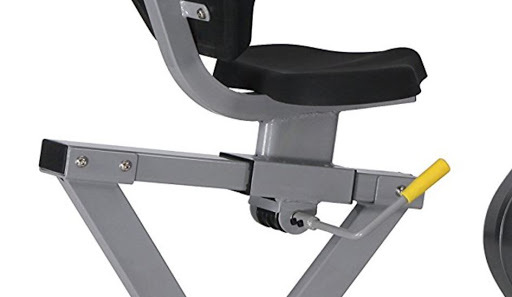 Because it is like a chair with pedals in front of the seat, to use this bike, you have to lean your back backwards and straighten your legs to reach the pedals. This posture makes it easy on your back and knees, especially suitable to those have problems with joints or being injured, kids, women and oldsters. 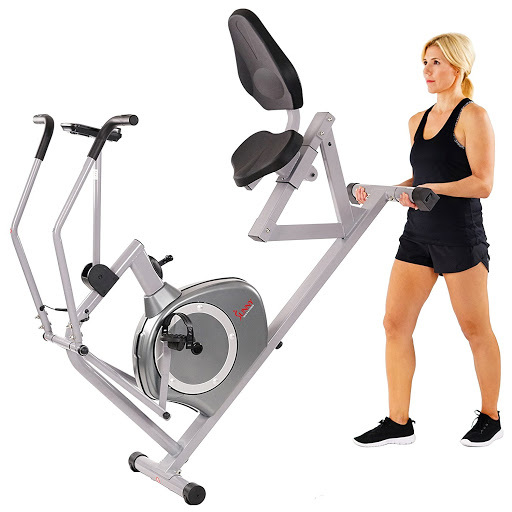 Therefore, the recumbent bike is the bike for blood flow, cardiovascular and lower body workout, and is the best choice for those want to maintain a healthy lifestyle or being in a physical rehabilitation and physical therapy. However, as said above, Sunny SF-RB4708 is different from a traditional recumbent exercise bike. 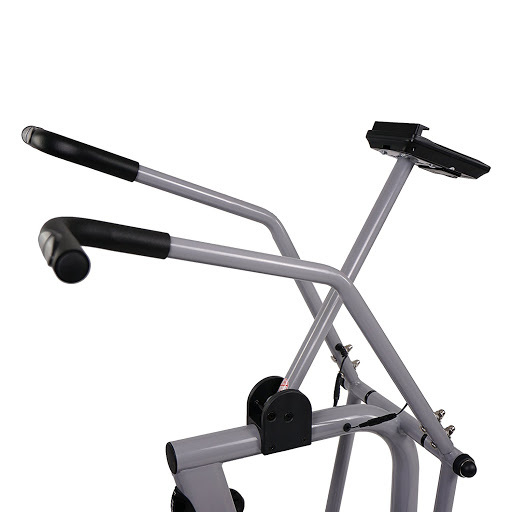 It has two moving handlebars, which let you practice your arms and chest. These handlebars will move backwards and forward, syncing with the movement of the pedals. So, I call it a dual-action recumbent bike. Sunny SF-RB4708 is extra sturdy. Its heavy duty frame can accommodate weights up to 350 lbs, which 50 lbs more than other bikes’ capacity. Padded oversized Seat bottom and back support the hips and back, and ensure a correct posture, increasing comfort during the workout. Two big handlebars for you to work your arms, chest and back. Integrated pulse sensors to read heartbeats per minute. Sunny SF-RB4708 is not so compact and lightweight due to its big handlebars. Indeed, its dimensions are 60 x 25.5 x 52 inches (152.4 x 64.77 x 132.08 centimeters) and its weight is 91 pounds (41.3 kgs). So, it seems that this bike is a bit bulky for a small department. Furthermore, it is delivered disassembly in a 106-pound box. You have to assemble it by yourself, which could take up from 1 to 2 hours. I am sure that you will need someone for help. The plastic straps of the pedals might hurt you. You might need a pair of shoes when exercising to avoid this. The console isn’t equipped with a backlight, thus, the screen is hard to see when in poor light conditions. Sunny SF-RB4708’s frame is made from steel tubes, including a longitudinal bar and two front and rear bars. The longitudinal bar is a single piece, in comparison with a two-piece bar, it makes the bike sturdier, but harder to assemble. The front and rear bars are attached to the main frame by bolts, giving the pedalling more stable. The front bar has transport wheels for easy movement, giving you the versatility to move your workouts to the family room while watching the kids or the den while enjoying your favourite tv program. By leaning it forward on its transport wheels, you will be handling less than 1/2 of the bike’s total assembled weight. The rear bar has stabilizers to provide steadiness, combining with its low centre of gravity keep the bike stable during workouts. You can place firmly this bike on a floor that has variation by turning these two levellers and a small leveller in the middle of the frame rail to level out the bike. The convenient step-through design on Sunny SF-RB4708 makes getting on the bike easy and safe. No need to over-extend your legs over a high bar to get on your exercise machine. 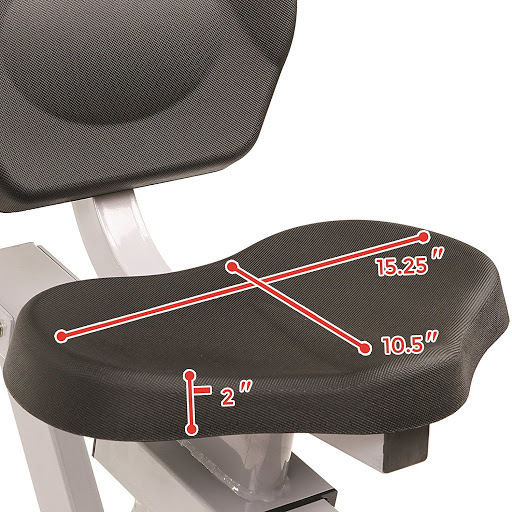 Simply step over the lower bar, take a seat and pedal toward your fitness goals. The Sunny SF-RB4708’s body is coated with a grey corrosion resistant paint, which can protect the bike from rust. 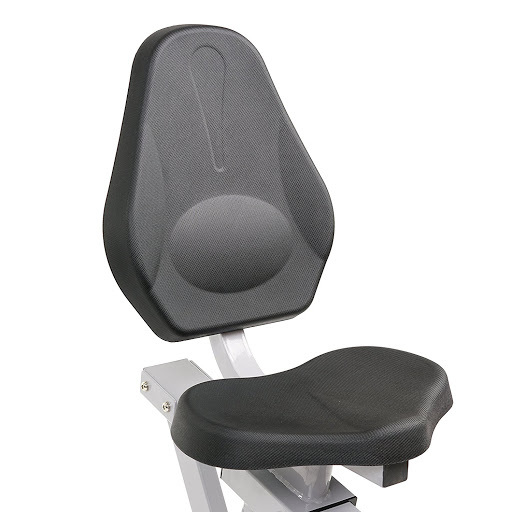 Sunny SF-RB4708 has a cushioned seat bottom, ensuring proper blood flow in the glutes for prolonged and vigorous workouts. This extra padding helps relieve pressure points in the tailbone due to sitting, enhancing comfort for the user. You can adjust the seat backwards and forwards to fit your height. Using the easy seat adjuster, you don’t need to get off the bike to make seating adjustments. It’s all done at the flick of a handle by your side with no hassle while you stay seated – an exclusive feature only found on Sunny Health & Fitness products. The distance from the seat to the pedals can be adjusted between 26.5″ and 34″ (67 – 86 cm). Also, the distance from the seat to the handlebars can be adjusted between 2″ and 36″ (30.5 – 91.5 cm). Which are in the touch range of 5’0″ – 6’5″ (153 – 195 cm) users. The backrest is padded too. And it is oversized to give you more back support. This backrest is cannot be adjusted, but it will move along with the seat on the adjustment rail. Besides the advantage of the padded seat is that your bottom and back will be supported comfortably, one disadvantage of this kind of seat is there is no air circulation. Which means you might feel hot and humid after long hours of workout. Sunny SF-RB4708’s pedals are designed with adjustable foot straps in order to provide proper alignment for efficient pedalling with ultimate control. They also enhance the comfort of user’s foot, ensuring the practising experience is smooth and rhythmic. However, the material of the straps is plastic, which may be considered as a minus point. You can fix this problem by a pair of sports shoes. Two movable handlebars give you the ability to work your upper body, especially arms, chest and back, synchronously with the legs during the pedal stroke to achieve a full body workout. You can only work your arms isolatedly by placing feet firmly on the floor. Two pulse sensors are integrated on the hand grips to read heartbeats per minute. You can monitor and maintain your target heart rate. Measuring your pulse rate is an important tool for exercising correctly and efficiently. The more steady and prolonged the elevated heart rate is during the workout, the more fat is burned. This important piece of health data will help you better understand your health and fitness status. I do not highly appreciate the console of Sunny SF-RB4708 since it is a medium-class exercise bike, but does not have any interesting functions and programs. The LCD screen on Sunny SF-RB4708 only gives you the ability to track your workout progress. It allows you to monitor your heart rate, distance, calories and time. It has an odometer function and it allows you to set up targets for time, distance, calories, and pulse. The console table is attached to a bar that allows angle adjustment, thus, you can easily adjust it in front of your eyes to see the workout metrics or to interact with your tablet. This is a smart feature, allows you to read book/watch movie on your phone/tablet during the workouts. You can also enjoy music while exercising, boosting your mood and performance. The beat is like a signal to your brain that keeps you maintaining a rhythm. You might pedal for hours without notice. 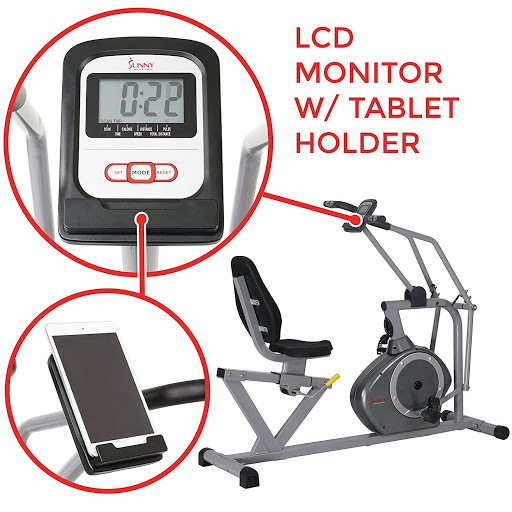 However, when you place a tablet/a phone on this holder, it will block part or all of the LCD display, making you unable to monitor your performance during your workout. Thanks to magnetic resistance mechanism, Sunny SF-RB4708 has 8 levels of resistance that can easily adjust using this knob, making the workout easier or harder as you want to burn your fat. Good seating position, good pedalling feeling. No strain on Back, shoulders, knees and ankles. Work your all body synchronously. 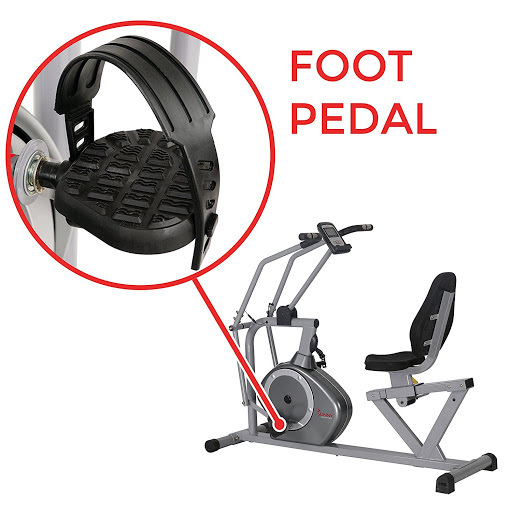 Suitable for those who have knee problems that cannot ride the bike using only two legs. Since the handlebars move along with the pedals, you can use your arms to support your legs. The console is so simple that literally has no interesting program, which is disappointing to a middle-class exercise bike like Sunny SF-RB4708. You might feel hot and humid after long hours of workout because the padded seat bottom and back do not support the air circulation. This bike seems not being able for intense and fast workouts. The seating position is like any other recumbent bikes. When sitting, your back will be slightly backward, leaning your back on the seat back, holding the handlebar to lift your body up. As the pedals are in front of you, you will straighten your legs, together with the lifted upper body, making a proper posture when exercising. However, the design is not ergonomic, so if you are used to seating on an ergonomically designed exercise bike, you will feel uncomfortable. This is a good posture that can support your back, shoulders, knees and ankles. The seat bottom and the backrest are padded and oversized. Almost your bottom and back will be supported well. It is really comfortable. However, in a long workout section, you still feel hot and wet since there is not much air flow. The handlebars are fixed in a good position that in your reach. However, they might be a bit high for somebody, and since they are not adjustable, this can be considered as a disadvantage. A heavy flywheel and knob resistance mechanism create resistance and momentum. When you start pedalling, your first several rotations are hard. The more you practice the more smooth and easier the rotations become, even, you need to generate a force to slow down the speed. This resistance and momentum make it interesting and effective when practising, that make you don’t want to stop once started. Sunny SF-RB4708 has 8 level tension resistance. You can turn the knob to increase or decrease the tension as you wish to practise. The solid frame provides stable feeling during your workout. All parts of the bike stay firm even in intense workouts. However, if you are not high enough, you cannot work your arms fast – it’s too awkward. Sunny SF-RB4708 is perfect for cardio workouts, and physical rehabilitation/physical therapy treatments, as well as maintaining a healthy lifestyle. Its smooth operation and joint supports make it’s suitable for those have joint problems or being injured. Even if your knees are too weak to pedal, you can use your arms to create supported force to your legs, when the handlebars and the pedals are synced. In addition, if you want to work your arms only, you can place your feet on the floor. Furthermore, using the tablet tray, you can enjoy music via your tablet while exercising. Music can not only boost your mood, push your performance, help you keep pace but also can be used for recovery. You might pedal for hours without notice that. Or you can set goals for yourself using the tablet, such as workout until the movie end. It sounds interesting, right? As said above, there is no annoying noise while practising, but just a soft whirring sound. But, there is a heat problem when you pedal for long hours due to the padded seat and backrest. However, you will need two AAA batteries for the console. Sunny SF-RB4708 costs about $300. A reasonable price for all the advantages the bike can offer you. 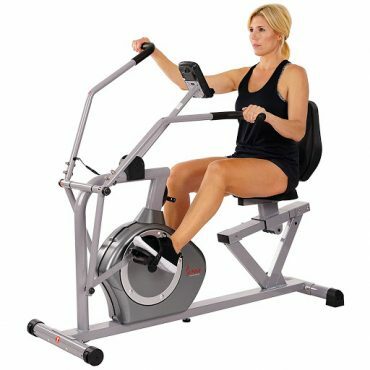 If you don’t like to assemble it yourself, you can pay an additional $70 for an Exercise Bike Assembly Service Package. However, I think you will enjoy the assembly section, making the bike all your like the experience of IKEA products. Sunny SF-RB4708 comes with a good warranty program: 3 years for Structural frame and 90 days for other parts and components, such as belt, upholstery, foam, ball bearings, pulleys, cables, shocks, all tension mechanisms, wheels, pedals and hardware. In warranty protected time, any defects will be fixed or replaced free. And note that the proof of purchase will be required. SF-RB4708 has a high Amazon product’s star ratings. This index uses an AI model instead of a raw data average to give customers better information. In particular, it considers the factors like the age of a review, helpfulness votes by customers and whether the reviews are from verified purchases, to calculate the final score. So, basically, this product is high-rated by customers. In the comment section, there are many positive reviews. They seemed to like the smooth ride, the sturdy and the affordable price for the features offered. They said that the bike was easy to assemble and the seat was so comfortable. They also confirmed that the operation was quite enough for them to enjoy movies. However, there are also some negative reviews. One said that the bike took him 2 days to assemble – maybe the Exercise Bike Assembly Service would be suitable for him. Some said that the bike was damaged when they opened the box – this problem obviously in the responsibility of the manufacturer, so if you face this, contact them for a replacement. And they said that the bike was not suitable for who taller than 6″, and not suitable for intense workouts since the max resistance was weak and the range of motion for pedals was small. You should consider this case. 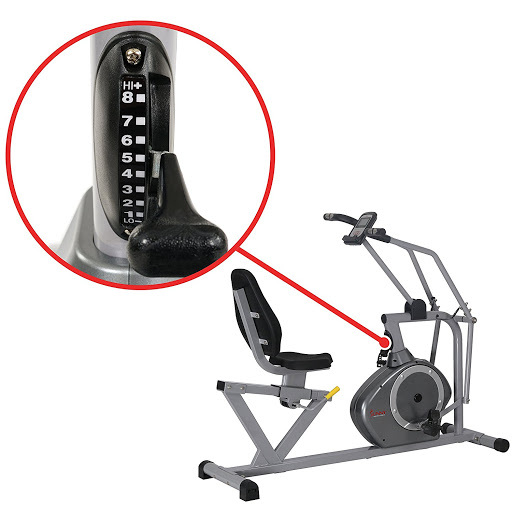 Overall, despite some disadvantages, SF-RB4708 is a good recumbent exercise bike at around $300 that allows you to work not only your lower body but also your upper body. In conclusion, Sunny SF-RB4708 is a good bike that gives you the ability to workout your all body synchronously. This bike is really suitable for those have problems with knees and joints. The bike costs about $300 and it worth that. By committing to exercise using this bike, surely you can improve your cardiovascular health and stay fit. It is especially good for physical rehabilitation/physical therapy treatment.